Every now and again we all need to treat ourselves to a little ‘me’ time. This is especially true when a regular day consists of a thousand unopened emails, dozens of voicemails (that you definitely don’t want to listen to but are too frightened to delete), Snapchat notifications blowing up on your phone, and a dog/small child/partner that requires at least some attention when you get home tonight. Life is, quite frankly, exhausting. In lieu of throwing it all in and moving to a small island to sell handmade pottery, Australia has some incredible health retreats that will have you chanting ‘ohm’ instead of ‘OMG’ in no time. Here are Australia’s best health retreats. 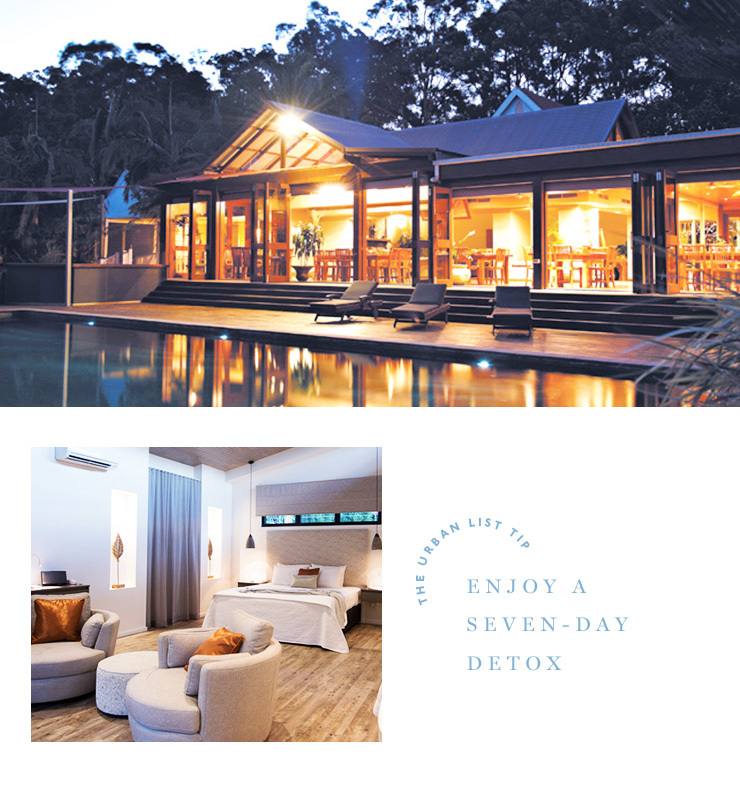 Dubbed the Rolls Royce of heath retreats, boost your energy levels with a seven-day detox at Gwinganna Health Retreat. Perched on the side of the mountain at Tallebudgera, Gwinganna features organic cuisine, two infinity edge swimming pools, luxury villas and the largest and best spa in the Southern Hemisphere. The best news? Absolutely no televisions or computers, so it's the perfect place to switch off, literally! Plus, Hugh Jackman is one of the owners so there's a chance you'll spot Wolverine working out in the gym. A coastal sanctuary on the east coast of Tasmania, everything at Saffire Freycinet, is aimed at improving your wellbeing. Just two and a half hours' scenic drive from Hobart, the spa is discreetly positioned overlooking the Hazards Mountains, Freycinet Peninsula and the pristine waters of Great Oyster Bay. Saffire Freycinet celebrates wellbeing, internal and external, with 20 luxurious suites, an exclusive day spa, restaurant, lounge and bar. Soothe your mind and refresh your soul with a luxurious treatment in one of Spa Saffire’s three retreat rooms overlooking the inspiring landscape and reflective pools. Nestled high above the Indian Ocean, set amongst melaleuca trees, Injidup Spa Retreat specialises in personally tailored treatments in closest proximity to the many wineries and attractions of the region. With just a handful of luxury villas, complete with their own private plunge pool, ocean views and indulgent spa treatments, Injidup is the perfect place to relax and unwind. 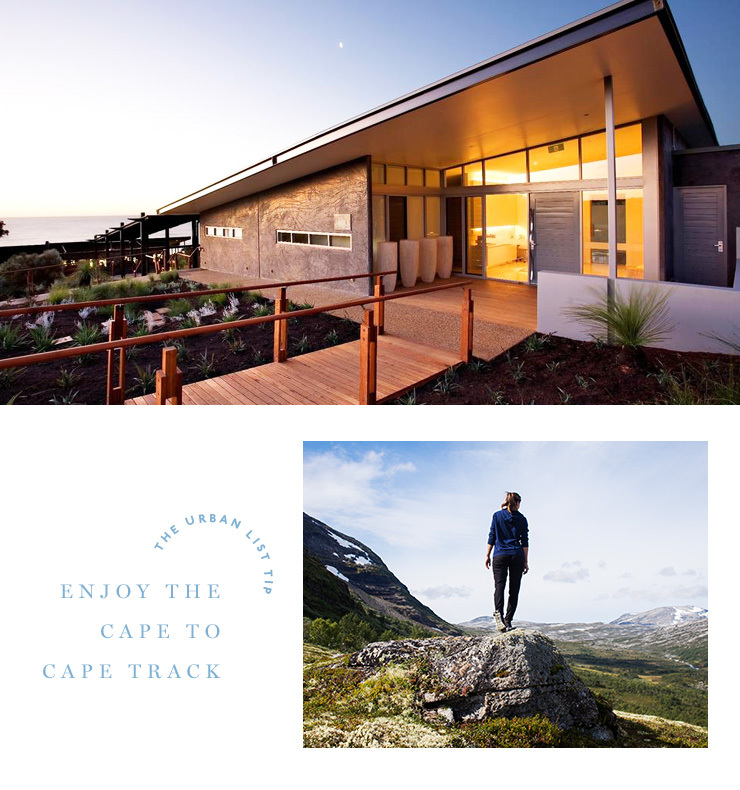 It’s also located directly on the renowned Cape To Cape Track, providing guests an ideal opportunity to enjoy an amble along the magnificent coastline and beaches. Tucked away in picturesque Daylesford, Samadhi Health and Wellness Retreat & Spa provides a peaceful sanctuary with experiences to nurture the body, mind, heart and soul. Constructed according to feng shui principles, the retreat has been purpose built to enhance your healing experience with colours, textures and simplicity of style. Their popular LifeShaping program helps you to make lasting changes in your life by combining seminars and workshops with therapies, nutrition, yoga and meditation. Surrender yourself to the beauty and healing cultures of internationally renowned Gaia Retreat & Day Spa. Nestled on 25 acres in the breathtaking Byron Bay hinterland, this all-inclusive resort is full of well-tended gardens, forest and orchards . 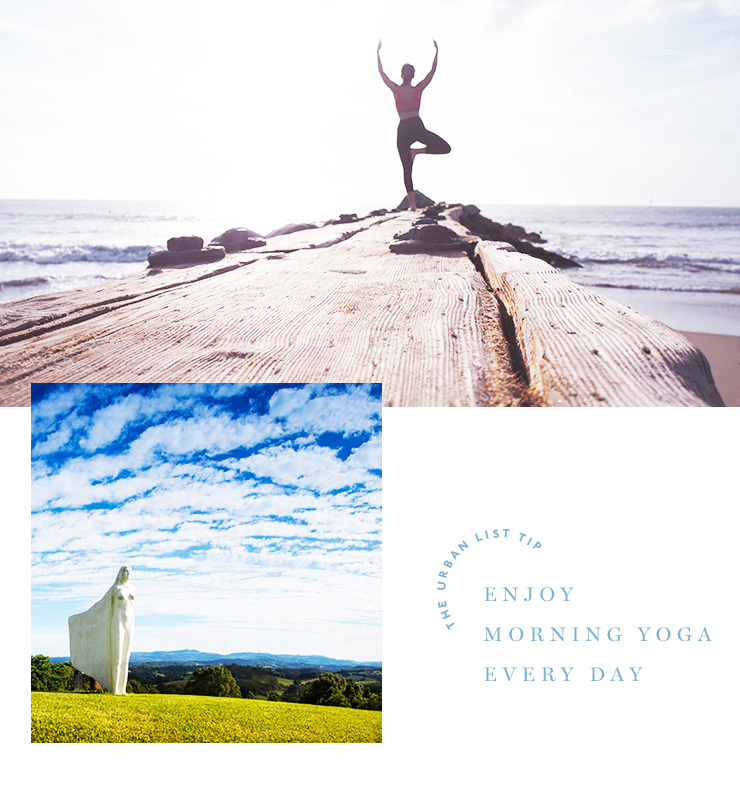 Each day you have the choice to rediscover peace of mind with restorative morning yoga along with two or more daily activities on offer. From fitness and boxing, to meditation and clay sculpture, there is sure to be something perfect for you. They say the longer the driveway, the more spectacular the house…well that’s certainly the case when it comes to Kangaroo Island’s Southern Ocean Lodge. Floating atop a secluded cliff on a rugged stretch of coast, the lodge boasts 21 luxurious suites with panoramic views of boundless coastal wilderness and the great Southern Ocean. Each suite features lavish sleeping areas, sunken lounge and glass-surround ensuite. The Southern Spa features signature treatments with Kangaroo Island botanicals designed to relax and rejuvenate. 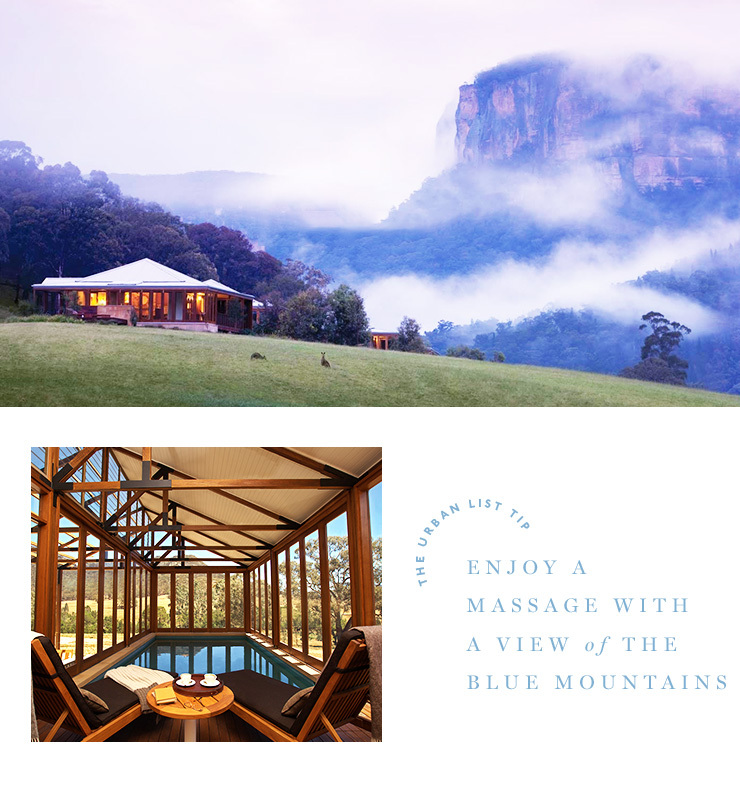 Settled amid the dusky seclusion of the Blue Mountains, the Wolgan Valley Spa is a tranquil forest gem. Overlooking majestic valley views, guests can enjoy their chosen pamper in one of six double-treatment rooms, complete with its own Japanese-style soaking tub, and then retreat to the cosy fireplaces and private pools of one of Wolgan’s freestanding suites. Health retreats not your vibe? Maybe one of these stunning Australian locations for your next stay-cay is more your cup of tea.